Which colors do I need to get from Spectrum? So a while ago I asked a Malibu rep for the color scheme of my boat so I could order some spectrum gel for some touch ups. He sent me a spreadsheet saying that I had Opal(main), Marble**charcoal(pinstripe), Dubonnet (Trim). I looked up the Dubonnet color first which was listed as 99-02 according to Spectrum. 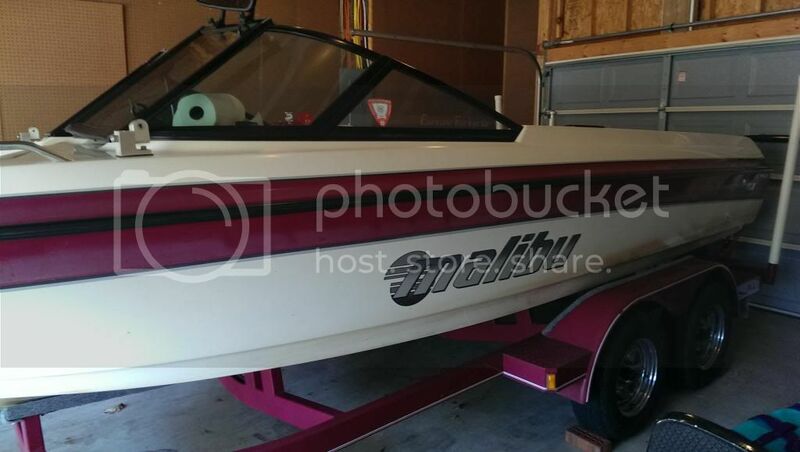 My boat is a '96 so I contacted the Malibu representative again, and after digging a bit more they only have one color listed for '96 which clearly isn't right. At some point their information must have gotten mixed up so I'm really not sure what colors we have. Someone suggested based on the Chee skins I received that the colors may be marble, ebony and reuben or possibly sangria. I was hoping to get a confident answer from someone so I'm adding a picture. I only really need the white and red. If you provided the VIN number on the back of your boat, the company should have the exact build sheet for your boat to find out the colours. If that's what you've done I'm not sure what else you can do. I later talked with him on the phone and he didn't seem to think the colors were right either. I posted here hoping to get a response like this. There are a lot of experts on this site and I'm hoping someone remembers the color options from this era well enough to know exactly what I have based on the picture.